Israel says it has inflicted huge damage on Syrian air defence after one of its fighter jets was brought down during a raid over Syria. Later on Saturday, Israeli Prime Minister Benjamin Netanyahu held a meeting with his military chiefs. He said Israel wanted peace but would defend itself "against any attack against us or any attempt by Iran to establish itself against us in Syria". How did events unfold on Saturday morning? Israel's military says one of its combat helicopters downed an Iranian drone infiltrating Israel. It tweeted footage of the incident. 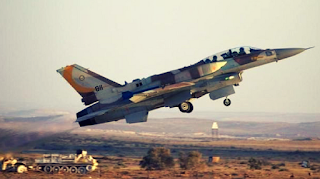 Israeli aircraft then attacked Syrian and "Iranian targets in Syria", the military says. Syria's state media say air defences opened fire in response to an Israeli attack on a military base, hitting more than one plane. The damaged F-16 came down in an empty field near the town of Harduf in northern Israel. It is unclear how exactly the plane was brought down. Gen Bar said it faced massive anti-aircraft fire, forcing the two pilots to eject. He said the crew did not report being hit before abandoning the aircraft. They were taken to hospital, one of them "severely injured", the Israeli military said. What did Israel do next? Israel launched a second wave of strikes in Syria. Eight of the Syrian targets belonged to the fourth Syrian division near Damascus, IDF spokesman Jonathan Conricus said. All the Israeli aircraft from this sortie returned safely. "We are not looking to escalate the situation," he added. Syria and its ally Iran deny that the drone entered Israel. Russia expressed "serious concern" over the Israeli air strikes and called for all sides to show restraint. What is the Iranian presence in Syria? Iran is Israel's arch-enemy, and Iranian troops have been fighting rebel groups since 2011. Tehran has sent military advisers, volunteer militias and, reportedly, hundreds of fighters from its Quds Force, the overseas arm of the Iranian Revolutionary Guards Corps (IRGC). It is also believed to have supplied thousands of tonnes of weaponry and munitions to help President Bashar al-Assad's forces and the pro-Iranian Hezbollah, which is fighting on Syria's side. Tehran has faced accusations that it is seeking to establish not just an arc of influence but a logistical land supply line from Iran through to Hezbollah in Lebanon.